COMMENTARY. The Occupy Wall Street movement, which has spread from one tent city to another across this country, has finally arrived at Harvard University. And because this is Harvard, the encampment has turned into the most exclusive Occupy protest in the nation. Students have pitched tents in the university's Harvard Yard, but you can't join the protest unless you possess a Harvard ID card. The occupiers had no intention of turning Occupy Harvard into a clubby experience. 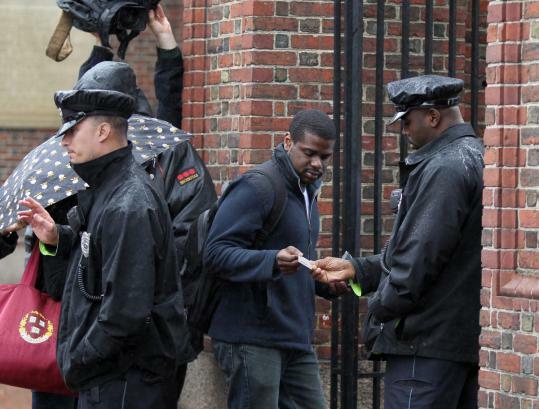 Harvard's administration, however, decided to post police at the entrances with instructions to keep all outsiders away. One protestor, who is a junior, lamented upon the heightened security to a reporter for the Harvard Crimson: "I think it's absurd. Do we really need eight guards per gate?" In a statement released Friday by Occupy Harvard, the group complained that the lockdown has "reinforced the institutional exclusivity and elitism that Occupy Harvard seeks to change." Of course, maintaining its exclusivity is what Harvard does instinctively, which is why it's perched at the top of the academic heap -- and, not to put too fine a point on it, why many of the Occupy students are in Cambridge in the first place. This past year, for instance, Harvard rejected about 94% of its applicants and some day the rejection rate will probably reach 99%. It certainly is ironic that the Occupy movement has reached Harvard, considering that this is the school that produces many of the nation's one percenters. And that's never going to change. To protect its elite status, Harvard will continue to educate the students of the nation's wealthiest families, which it has been doing for centuries. It's not the multimillionaires' kids, but the teenagers from poor families who tremendously benefit from a Harvard education. Research has resoundingly shown that. And yet, according to federal statistics, only 15% of Harvard students are low income. If you are going to open up Harvard's gates, these are the people you should be letting in.